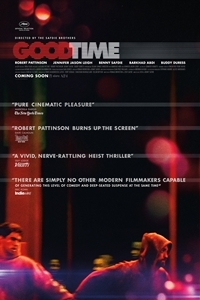 My first thought upon leaving co-directors Benny and Josh Safdie’s Good Time (Josh co-wrote, while Benny co-stars alongside an intense, controlled Robert Pattinson) was: A soundtrack in search of a movie. That’s not altogether fair, but it is understandable: Daniel Lopatin’s propulsive electronic throb and thrum display an excellence and precision that most decidedly do not come through in cinematographer Sean Price Williams’s beyond-extensive use of closeups. (And since the directors tend to call the shots about when it comes to camera placement…) Pattinson can act, even if he often seems just a touch removed and remote, and he’s not hard to look at. But to justify the amount of acreage his face occupies for what seems like half the film, his young mug would have to fascinate, to serve as a clear expression of the complicated machinations below its surface. If that’s the case, then it’s an honest portrait, if an unattractive one. And the Safdies excel at catching the feel of those who really are living on the edge: struggling immigrants, hopeless ex-cons, and the tortured souls who cannot build a life with their pieces of the broken world. Maybe it’s not their fault that this dark joyride offers neither an ordered route nor a satisfying destination.